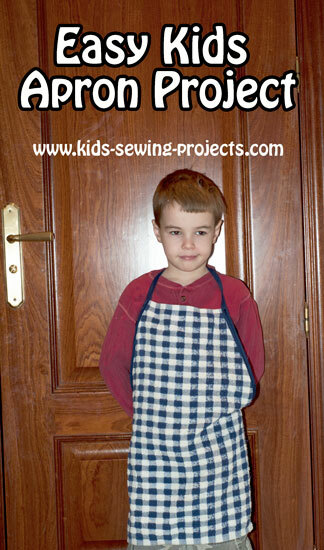 An easy kids apron they can sew themselves or with little supervision. 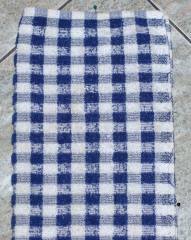 Wash your dishtowel in the laundry before sewing. 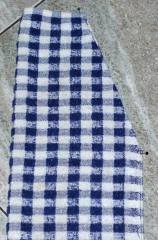 Lay your dishtowel flat and fold in half lengthwise. Measure 10 inches from the top and place a pin or use a pencil to mark the spot. Now measure 4 inches from the folded edge. Pin or use a pencil to mark this spot. 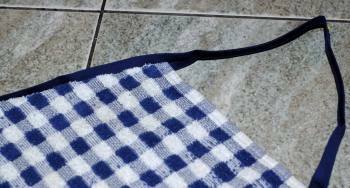 Cut a straight line through the towel from one pin to the other pin. Unfold and lay open. Fold your bias tape in half meeting the ends together. This will help you find the very middle of the tape. Measure 6 inches down from the middle and pin on each side. should be on the back side of the towel. 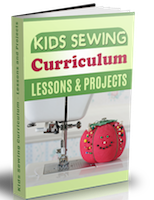 Here is more sewing instruction on using bias tape. Continue pinning along sides of apron. Starting at one end of the bias tape sew together. Either hand sew with a straight running stitch along the edges of the tape, or sew using the sewing machine. 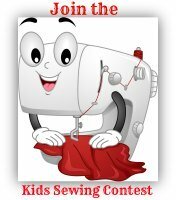 Remove pins as you sew along. Tie a knot in the bias tape at each end. 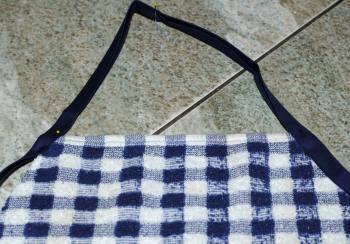 If you would like pockets use a longer towel and fold the end of your apron up a few inches and sew along side edges. 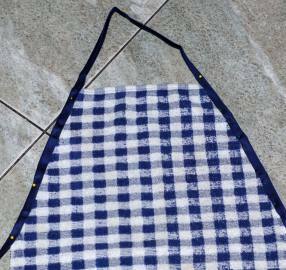 Try a similar apron project using a pillowcase.